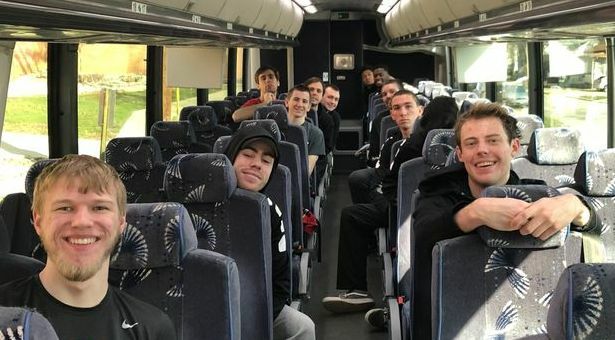 This weekend the men’s volleyball team took on the challenge of traveling over 300 miles to play Wittenberg University and Mount Saint Joseph University. Each team was good competition for GU and were top teams in the conference in the past year. Mount St. Joe’s is also the #11 team in the country. The Panthers ended the weekend 0-2 but put in a good weekend of work. Emmanuel Christian Academy in Springfield, Ohio. Media by ecaoh.org. The Wittenberg game was especially interesting. The game ended up taking place in a small private school called Emmanuel Christian Academy, which is a K-12 school. The first set was close, but then the Panthers were struck with a mid-set lull, which put them in a hole and caused them to lose the first set 22-25. The second set was a bit of a struggle. The Panthers put themselves in another big hole that they could not dig themselves out of and eventually lost the set 17-25. In the third set, Coach Phil Davis decided to switch things up by putting Colin Hill in the game, replacing George Black. The third set was close in its entirety. The energy and effort in that third set propelled the Panthers to win 25-21 in a convincing fashion. The Wittenberg Tigers came out in the fourth set with a newfound energy led by their star player, Ashton Sellers’ serves. The Tigers topped the game and won 25-18. As disappointing as losing a winnable game was, the Panthers can take solace in the fact that they responded well to adversity. 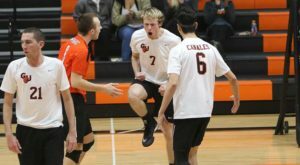 George Black getting pumped after a kill. Media by Greenville University. The next day, the Panthers took on another impressive team: the Mount St. Joseph Lions. The Lions came into the game winning the last eight games in a row, as well as being the #11 team in the country. In the first set, the Panthers succumbed to their trademark mid-set and were not able to come back from that deficit losing 21-25. The next set the Panthers played some of their best team volleyball of the year. They were down 20-22 in the second set and then went on to win the set 25-23. In the next two sets, the Lions showed why they are one of the top teams in the country. Led by Adam Williams’ 24 kills, they went on to win the next two sets 17-25 and 18-25. It was a disappointing weekend no doubt, but there are a few things that came from the weekend. When the Panthers play as a team, winning is possible no matter the opponent. Most of the time when the Panthers lose, it is from the errors that they bring on themselves. Captain Johnny Milabu says, “A lot of the time our losses come from a lack of focus. Since we have a small team, when someone is down it is hard to pick ourselves back up.” If they can use what they learned this weekend, the Panthers could very well be be on the rise.